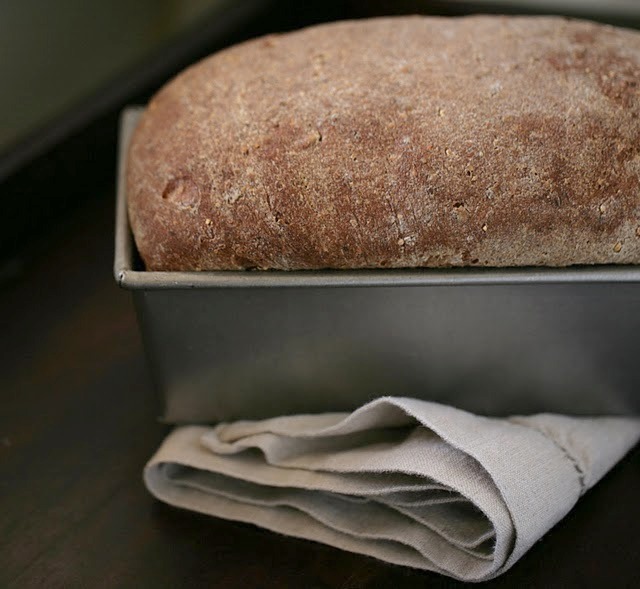 I wanted something hearty and healthy to pair with the walnut butters I made this weekend, and this Whole Grain & Seed Bread was just the thing. The recipe yields two loaves; I sliced and froze one, though you could halve the recipe if desired. This bread is dense and substantial (verging on heavy) and therefore better suited to toast than sandwiches. You could lighten it by substituting unbleached all purpose flour for half the whole wheat flour, but you'd be diminishing its whole grain benefits. 3. Unless you have a bowl the size of a cauldron (lucky you for having the cabinet space), divide the dough (if you haven't already, as I did in Step 2) and place each piece in a large bowl coated with cooking spray. Cover with towels and set the dough in a warm place to rise for about 45 minutes, or until it's doubled in size and indentations remain when you press it with your fingers. 4. Working with one portion of dough at a time, punch it down and turn it out onto a well-floured surface. Dust with flour and roll into a rectangle about 10 x 15 inches. Starting with the short edge, roll up the rectangle tightly, pressing to rid it of air pockets. Place each roll in a 9 x 5 inch loaf pan coated with cooking spray, seam side down, tucking the edges of the roll under if needed. Cover with towels and set in a warm place to rise for another 45 minutes or until doubled again in size. 5. Heat oven to 350 degrees F. Uncover loaves and place in oven on center rack; bake for about 40 minutes or until they're browned and sound hollow when tapped. TIP: To get a brown and chewy crust, use a spray bottle to periodically (about every 10 minutes) spray the bottom and sides of the oven with water. (Open the oven door just enough to spray the water into the oven, then close it immediately.) Steam is an element you can easily add to your home baking repertoire to make your bread more bakery-like. this bread is delish. My family and I loved it. Thanks for a great recipe. can't wait to make it again! Andrea, thanks for letting me know that you made the bread and that your family loved it. Your comment made my day!